Next, I cut the fruit open on the counter while BabyC watches. Then I show her the inside of the fruit and let her touch it and smell it again. By this point, BabyC is usually really excited and ready to eat. Finally, I cut the fruit into pieces that are a little more manageable for her, and we both sit down to enjoy eating together. What a great way to engage all your baby’s senses! 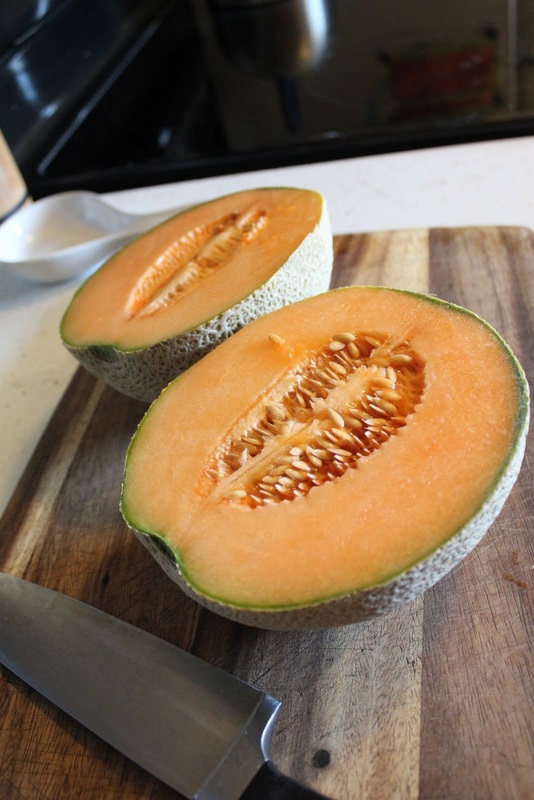 If this was the first time you’d seen the inside of a cantaloupe, wouldn’t you be interested in exploring it further? 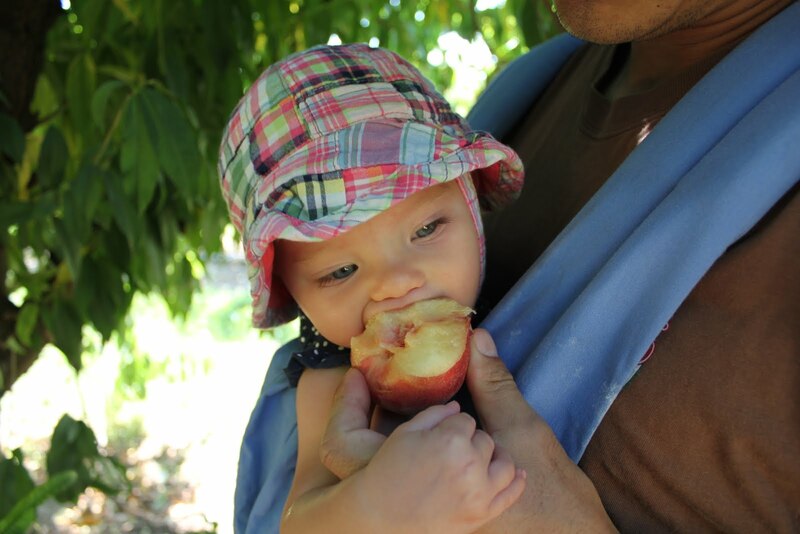 To further cultivate our baby’s understanding of food, we have also visited several local u-pick farms this summer. Many of us will take our kids to a pumpkin patch in a month or so for some classic photo ops. Pumpkins are really fun, but right now is harvest time for lots of foods that your kids already know and love, so it is a perfect time to visit a local farm and learn more about where your food comes from. 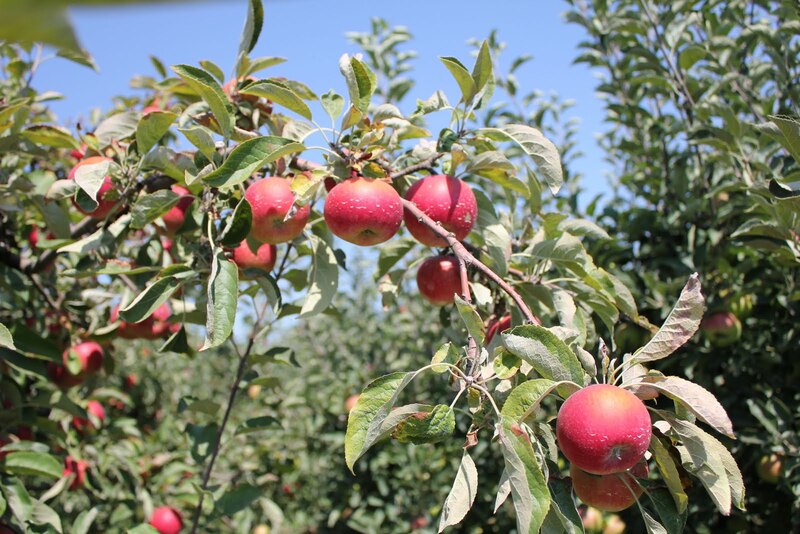 We visited Detering Orchards just outside of Eugene last week. 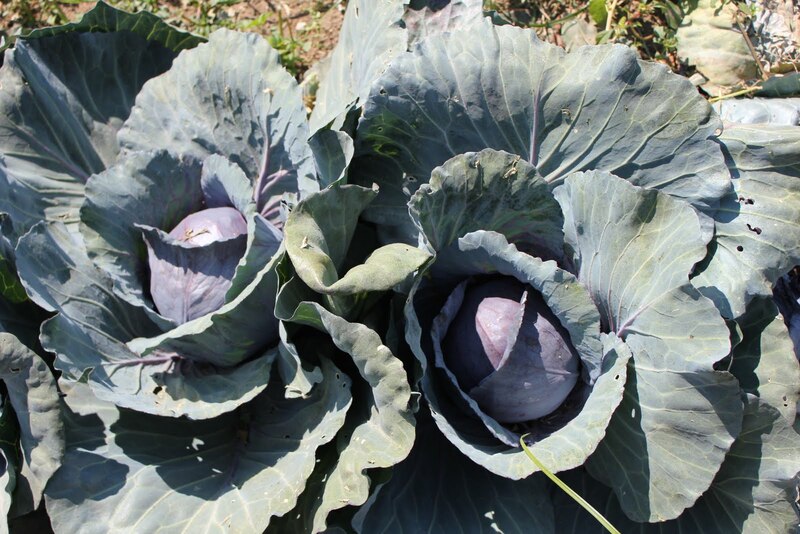 They have lots of u-pick fruits and vegetables in addition to a gorgeous farmstand where you can buy pre-picked produce. What I love about this farm in particular is that their crops are so diverse. We went out to pick apples but then stumbled into some gorgeous fields of cabbages, broccoli, and beets, and then we wandered over to the peach trees. We also had a 2- and a 4-year-old with us, and they loved checking out the veggies, especially hunting for ripe beets. (I’m not sure the beets were supposed to be u-pick, but how can you deny a 4-year-old that is really excited about beets?) BabyC had a great time, too. I’m sure BabyC’s understanding of where her food comes from is pretty rudimentary at this point, but I like to think that there is some wiring in her brain associating delicious food with the texture of dirt and the fragrance of an orchard. In fact, I’m pretty sure that she thinks dirt is a food right now, because it goes straight in her mouth. Responsible mama note: If you are going to do some tasting of freshly-picked foods, be sure to check the farm’s policy on spraying pesticides and choose an organic farm to be safe. Also, be aware that there are risks of foodborne illness associated with eating even organic foods without washing them first. 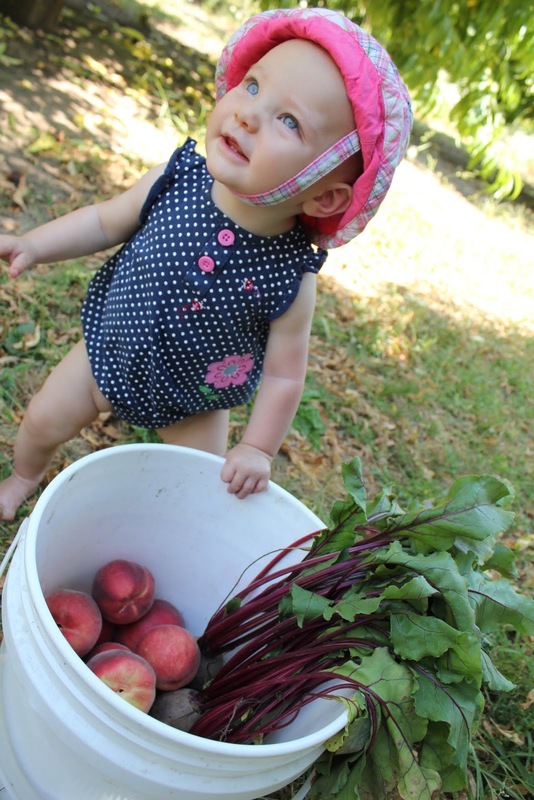 This post depicts irresponsible parenting behavior – eating produce fresh off the farm. I grew up on a farm where we ate straight out of the garden all the time, but I should really take this more seriously because I hate the thought of my kid getting sick! It is best to pick first and save the tasting until both food and hands have been washed. Thank you for your post. It's great that you're finding ways to introduce your child to new foods and family meal time as early as you are. With such good role models, these practices well set her up well for a lifetime of healthy eating habits! This is fantastic, Alice. Great pictures, great narrative and character. Well, and you're also my sister, and I love you. @Kiyah – Thanks! I'm pretty sure my parents instilled the same values in me and my brother when we were kids. I do think it makes a huge difference throughout our lives. @Jordan – Thanks for your sweet words. It really means a lot! I will always value your feedback! We prioritize family dinners, too, and have since my now four year old was about your baby's age. I'm glad we did- I think it has started paying dividends. We've tried the gardening approach to introducing more veggies, too. So far, that has yet to pay any dividends beyond giving the grown ups more fresh produce to eat! But maybe it will when our kids our older. I kind of love the "I'll have what MAMA is having!" and kind of wish I could eat my own damn meal sometimes. 🙂 But Bug eats practically everything (today: very strong sheep cheese, soy yogurt, fresh peaches, half of my breakfast….) and it's a good encouragement to always have veggies for dinner! Jenny, I've discovered recently that BabyC is starting to prefer strong flavors too. I'd been going to all this trouble to pull food out from dishes before it is seasoned, but then she'll randomly eat some curry off my plate and want more, more, more! I'm trying to just feed her what I'm eating, within reason, and go with it. 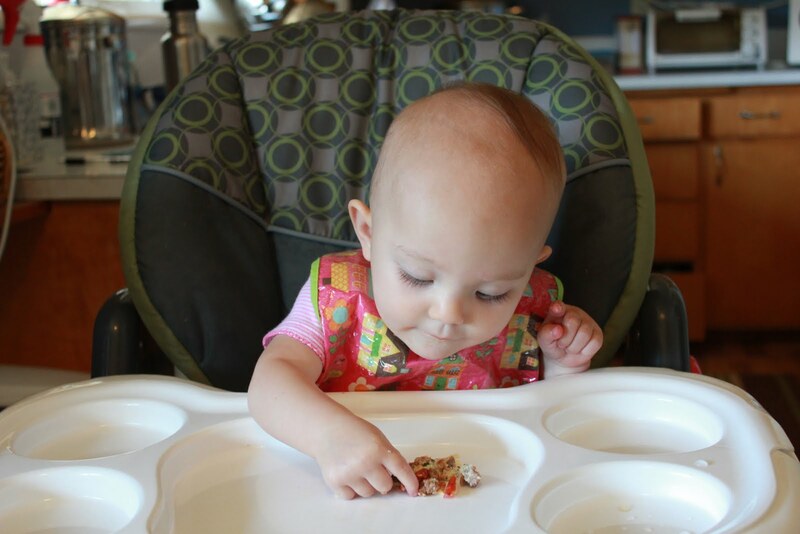 I love Bug's adventurous palate – how wonderful for a toddler! Really like the new blog. Love the photos. Love that you grew up on a farm! A dairy one? Anyhow, I was born and raised in the Mid West next to a farm so am now day dreaming about a big red barn. Really, BabyC eats curry? Amazing! Thanks for linking to me Elaine! That made my day! And I'm glad you liked my post – I love your blog too!